Action from Panthers' big win over Scunthorpe. Promoter Ged Rathbone believes the Peterborough fans can roar their team to victory against Sheffield all over again. The ‘T Balfe Construction’ Panthers entertain the Tigers at the East of England Showground tonight (April 8) starting at 7.30pm. It is a crucial fixture in the race for top spot in the Midland Group and a place in the latter stages of the Premier League Cup. And Rathbone also expects it to be one of the toughest challenges his team face on their own Alwalton shale all season. That’s why he is emphasising the need for a bumper attendance and vociferous backing - just as Peterborough received when sinking Sheffield in the quarter-finals of the play-offs last season. Rathbone said: “The crowd was excellent and the atmosphere was absolutely brilliant for the play-off meeting against Sheffield last season. “The support really helped us get through on that occasion and we need the same sort of turnout and backing again tonight. “It might be very early in the season, but this promises to be one of the meetings of 2016 at the Showground. “Sheffield are packed with riders who like our track and go well here. It is going to be an absolute cracker and hopefully the fans can really get behind our boys. 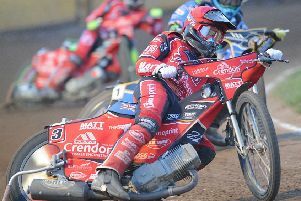 Sheffield went three points clear at the top of Midland Group courtesy of a 49-41 victory over Scunthorpe at Owlerton last night. They have ridden one more meeting than Peterborough who can return to the summit by collecting all three available points tonight. Peterborough then go to Scunthorpe on Sunday. They slammed the Scorpions 64-26 at Alwalton last Friday.